Scientists are developing a common language that will let dolphins and humans communicate with each other. Seaweed may Earth’s oldest plant. Do you know who these enameled and filigree gold false teeth belonged to? If you do, there’s a reward for $500. And even if you don’t, a good enough made-up story could still win you some money. Beautiful photographs of a trip around the world looking at human affects on climate change and biodiversity loss. Timelapse video of wild animals consuming an elephant. New photographs of the Moon. Scientists hope to recover Amelia Earhart’s DNA from envelops she liked more than 70 years ago. Who came first, the walking cactus or the arthropod? Science can create the illusion that you have three arms. And you’ll believe it! Robots train for the world’s first full robot-marathon. A hedgehog-like mammal uses its quills to communicate. An 11,500-year-old house is uncovered in Alaska, along with the oldest human remains yet discovered in northern North America. The big question: What kind of spider did Duane Wetzler find? There are a few options. In such a sensational case as this, some sort of extraterrestrial creepy crawly is always a possibility, but we can probably rule out an alien-arachnid in this case. Why? Most spiders from space have at least five “evil pair of jaws.” Let’s look at the spider species a little closer to home. When trying to identify Fort Collins spiders, CSU’s Extension resource “Spiders in the Home” is a great first stop. However, since it was written in 2008, I can understand why it wasn’t used as an original reference. 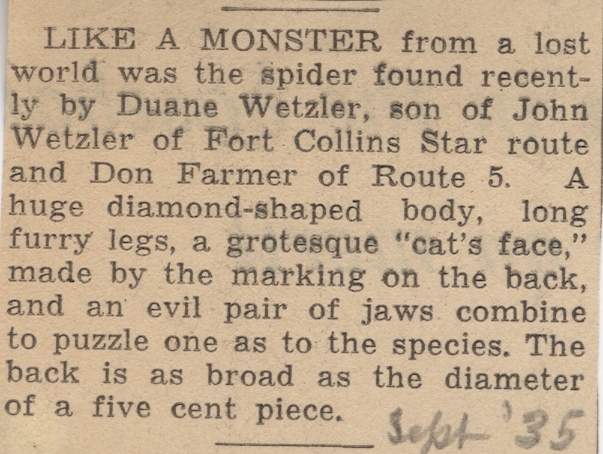 Looking through “Spiders in the Home,” an obvious candidate for Weltzer’s spider of terror emerges: The “Catface” Spider. “Cat’s face” markings on the back (abdomen)? Check! Evil pair of jaws? Well, we won’t call them evil, but…Check! Broad as the diameter of a five cent piece? Since female Catface spiders can be over 1/4″ in diameter, Check! While perhaps not the prettiest of spiders (Katie’s vote for that category goes to the Mabel Orchard Spider), the catface spider (Araneus gemmoides) is harmless and not nearly the “monster from a lost world” the newspaper post made it out to be. But you have to wonder, what do you think the paper would have written about the tarantulas that live in the southern part of the state? Let’s stick with the catface spiders, shall we? The Chevron Corp. has been ordered to pay at least $8.6 billion in restitution for its pollution of the Amazon. It’s imaginary…for now…but what if bees worked for the police? How much money would it take to catalog all the remaining unknown organisms on Earth? Over $200 billion U.S. Speaking of cataloging all life on Earth, have you heard about the Barcode of Life Project? Some of van Gogh’s vibrant yellows are turning brown. The reason? A chemical reaction never before seen in paint. An essay on the importance (and irresponsibility) of the language used to describe and discuss “undiscovered” tribes. Check out Myrmecos, the blog of biologist and wildlife photographer Alex Wild. You eat over 100 trillion genes every day. Yum! Some Egyptian mummies have false toes – and it looks like they worked when the people were alive. And ancient Homo sapiens had spring-loaded heels. And Lucy’s species, Australopithecus afarensis, appears to have moved more like modern humans than we once thought. From the Collection: Can You Count the Moves? A few months back I wrote about a recent acquisition of prescription slips from the City Drug store. 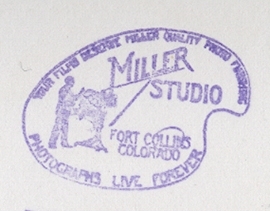 After completing the re-housing of prescription slips from the store’s cigar boxes to archival boxes, I was left with one burning question… where was this place? The answer- as is often the case- was not a simple one. 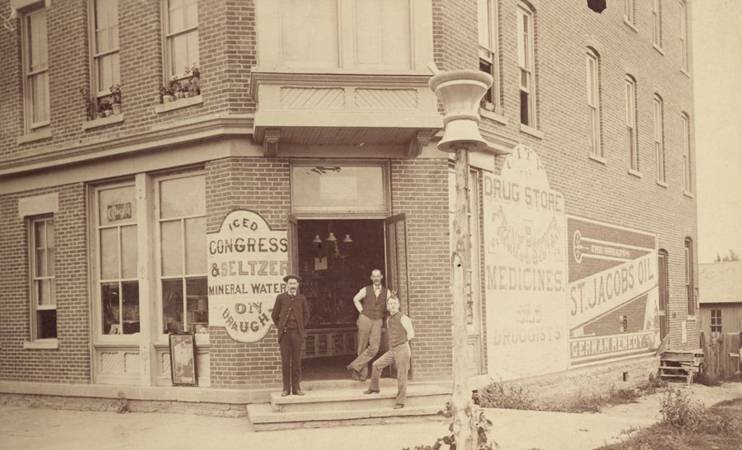 Boasted as “the oldest legitimate business in Fort Collins,” City Drug first opened in 1873. Its original owners were a pharmacist, M.E. Hocker, and two local business men, William C. Stover and John C. Mathews. 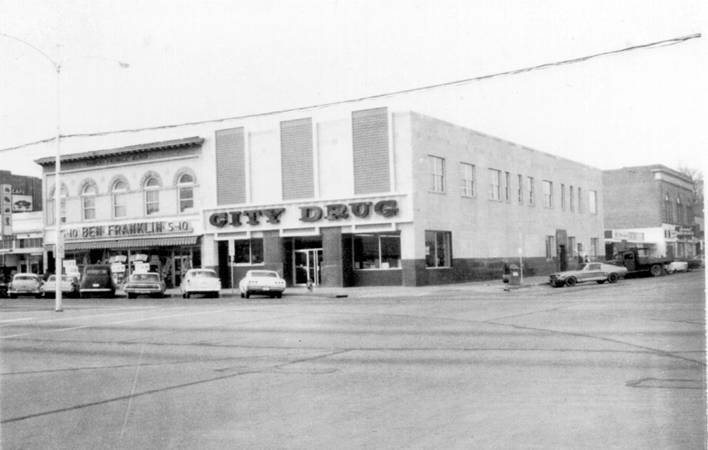 City Drug’s first location was at the southwest corner of Jefferson and Linden streets in one of the oldest buildings in Fort Collins, known as “Old Grout” for the enthusiastic use of grout in its construction. From Old Grout, City Drug went on to have numerous locations and owners. 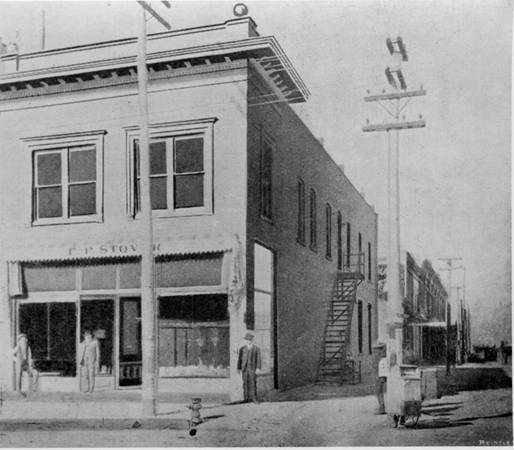 When the Yount Bank Building on the southeast corner of Jefferson and Linden was completed in 1874, City Drug quickly moved across the street and into it. 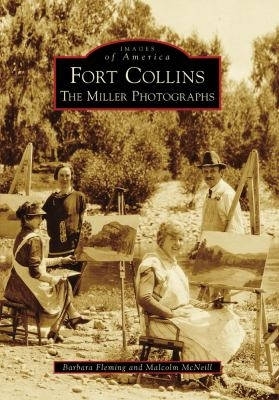 In the same year, William Stover sold his interest in the business to his brother, Frank, who had just arrived in Fort Collins. At this point, both W.C. Stover and Mathews retired from the drug store in order to pursue other business interests in town. 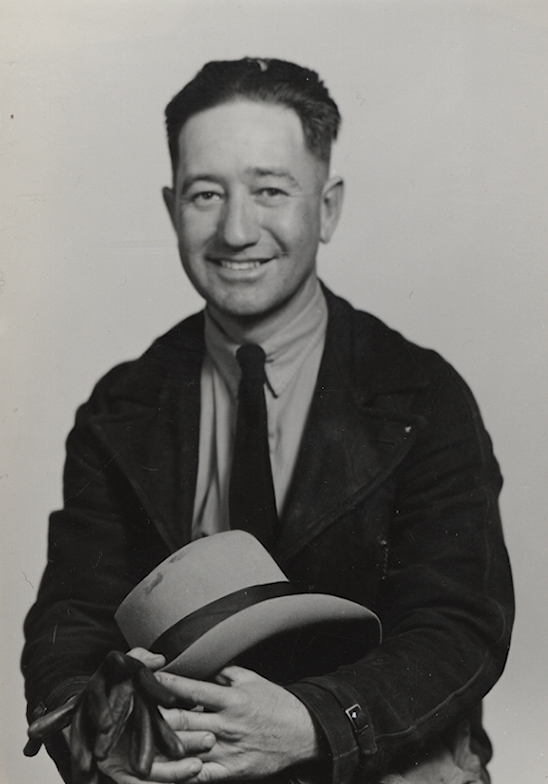 Eventually, Frank P. Stover bought out Hocker and became sole owner of City Drug. During this time Stover moved the business again, this time to the northwest corner of Jefferson and Linden streets, where he rented a corner section of the Tedman House. Soon after, the store made its way back to its original location, but this time it inhabited a brand new brick building since the log-walled Old Grout had been torn down and replaced at the commission of Frank Stover. 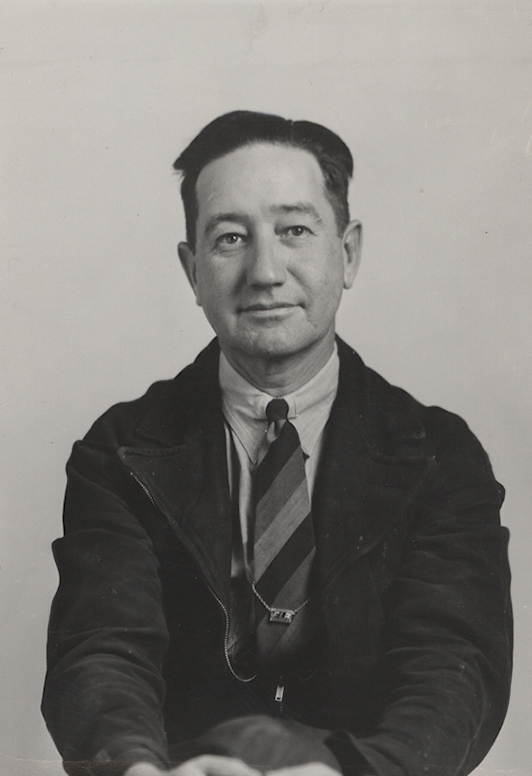 Upon his retirement in 1919, Stover sold City Drug to C.L. Brewer. With Brewer at the helm, the drug store moved three more times in an attempt to be a central part of the city. In its first year of Brewer’s ownership, City Drug relocated to 143 Linden Street. Seven years later, it moved to 145 N. College Avenue and again to the “Woolworth Building” at the northwest corner of College and Mountain avenues. 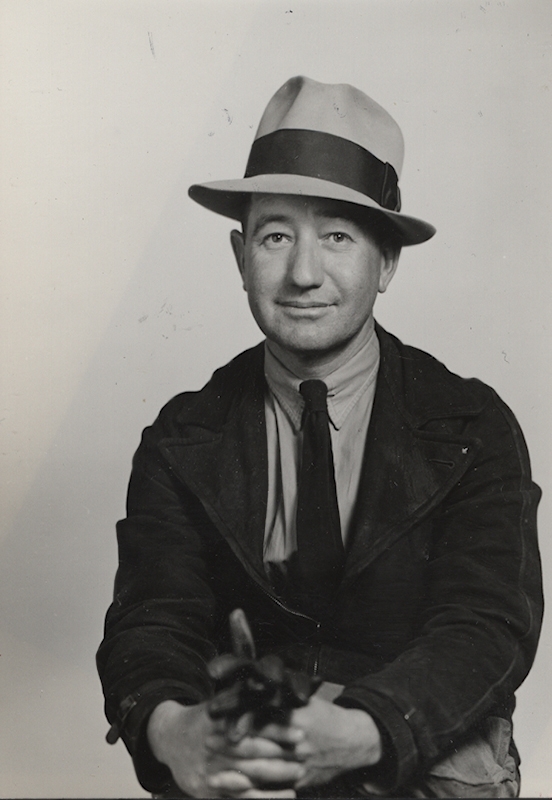 In 1946, Brewer sold City Drug to brothers Arthur and Harold Grovert. The Groverts also relocated the business more than once. First, they moved to 139 N. College Avenue and again in 1967 to the southwest corner of College and Mountain Avenues. City Drug c. 1969, 101 S. College Ave. 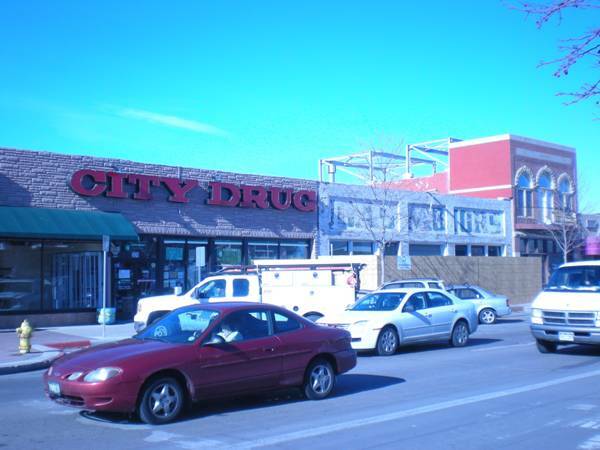 In 1992, City Drug was purchased by its current owners, the Wilkins family. The Wilkins continued to run the drug store at the southwest corner of College and Mountain until September of 2009, when the business made its final move to 209 N. College Avenue, formerly know as the Ghent Motors Building. Current location of City Drug just north of LaPorte Ave.
Whew, moving makes me tired… even if it is just reading about it! From the Archive: Valentines Now Arriving at the Depot! Please accept these warm Valentine’s Day wishes from the pupils of Thunderbird Cottage School. 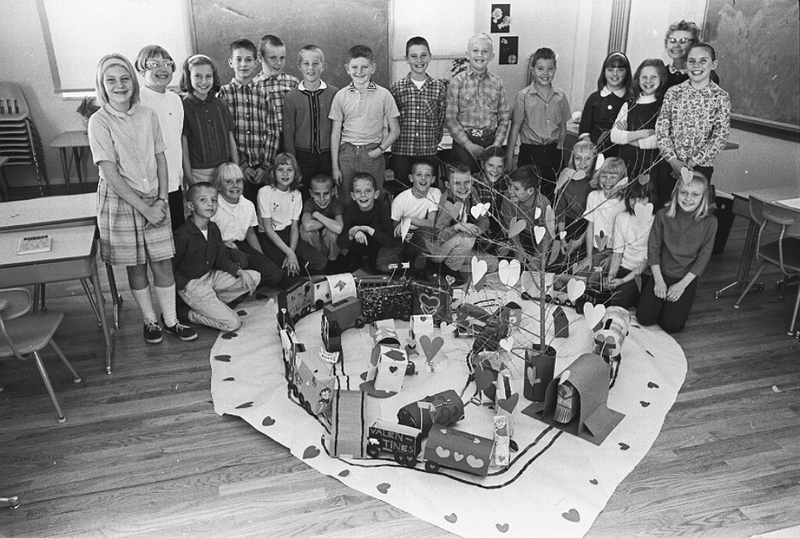 The students of this school, once located at 2812 Harvard Avenue in Fort Collins, worked on this LOVE-ly railroad back in 1966. I believe that even after 45 years, it still makes Cupid proud! Do you have any fond memories of Valentine’s Day crafts you made in school? 202 years after his birth, and 152 years after the publication of On the Origin of Species, Darwin’s still going strong! How would you celebrate Darwin’s big 2-0-2?